Mayonnaise (/ˈmeɪəneɪz/, /ˌmeɪəˈneɪz/ or in AmE also /ˈmæneɪz/, and often abbreviated as mayo /ˈmeɪoʊ/) is a thick, creamy dressing often used as a condiment. It is a stable emulsion of oil, egg yolk, and either vinegar or lemon juice, with many options for embellishment with other herbs and spices. Proteins and lecithin in the egg yolk serve as emulsifiers in both mayonnaise and hollandaise sauce. Commercial egg-free alternatives are available for vegans and others who want to avoid animal products and cholesterol, or who are allergic to eggs. Take three spoonfuls of Allemande, six ditto of aspic, and two of oil. Add a little tarragon vinegar, that has not boiled, some pepper and salt, and minced ravigotte, or merely some parsley. Then put in the members of fowl, or fillets of soles, &c. Your mayonnaise must be put to ice; neither are you to put the members into your sauce till it begins to freeze. Next dish your meat or fish, mask with the sauce before it be quite frozen, and garnish your dish with whatever you think proper, as beet root, jelly, nasturtiums, &c.
This sauce is made to "take" in many ways: with raw egg yolks, with gelatine, with veal or veal brain glaze. 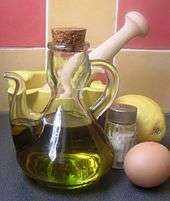 The most common method is to take a raw egg yolk in a small terrine, with a little salt and lemon juice: take a wooden spoon, turn it while letting a trickle of oil fall and stirring constantly; as your sauce thickens, add a little vinegar; put in too a pound of good oil: serve your sauce with good salt: serve it white or green, adding green of ravigote or green of spinach. This sauce is used for cold fish entrees, or salad of vegetables cooked in salt water. In 1808, Grimod de La Reynière referred to a "bayonnaise" sauce: "But if one wants to make from this cold chicken, a dish of distinction, one composes a bayonnaise, whose green jelly, of a good consistency, forms the most worthy ornament of poultry and fish salads." One of the most common places named as the origin of mayonnaise is the town of Mahón in Menorca, Spain, where it was then taken to France after Armand de Vignerot du Plessis's victory over the British at the city's port in 1756. According to this version, the sauce was originally known as salsa mayonesa in Spanish and maonesa (later maionesa) in Catalan (as it is still known in Menorca), later becoming mayonnaise as it was popularized by the French. The Larousse Gastronomique suggests: "Mayonnaise, in our view, is a popular corruption of moyeunaise, derived from the very old French word moyeu, which means yolk of egg." The sauce may have been christened mayennaise after Charles de Lorraine, duke of Mayenne, because he took the time to finish his meal of chicken with cold sauce before being defeated in the Battle of Arques. According to Trutter et al. : "It is highly probable that wherever olive oil existed, a simple preparation of oil and egg came about — particularly in the Mediterranean region, where aioli (oil and garlic) is made." According to the Oxford English Dictionary, the term mayonnaise was in use in English as early as 1823 in the journal of Lady Blessington. 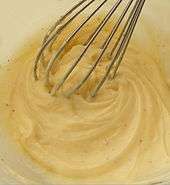 Mayonnaise can be made by hand with a mortar and pestle, whisk, or fork, or with the aid of an electric mixer or blender. It is made by slowly adding oil to an egg yolk, while whisking vigorously to disperse the oil. The oil and the water in yolks form a base of the emulsion, while lecithin and protein from the yolks are the emulsifiers that stabilize it. A combination of van der Waals interactions and electrostatic repulsion determine the bond strength among oil droplets. The high viscosity of mayonnaise is attributed to the total strength created by these two intermolecular forces. Taste and further stabilize the emulsion, as mustard contains small amounts of lecithin. If vinegar is added directly to the yolk, it can emulsify more oil, thus making more mayonnaise. Chile is the world's third major per capita consumer of mayonnaise and first in Latin America. Mayonnaise became widely accessible in the 1980s. Guidelines issued in September 1991 by Europe's Federation of the Condiment Sauce Industries recommend that oil and liquid egg yolk levels in mayonnaise should be at least 70% and 5%, respectively. The Netherlands incorporated this guideline in 1998 into the law Warenwetbesluit Gereserveerde aanduidingen in article 4. Most available brands easily exceed this target. Commercial mayonnaise sold in jars originated in Philadelphia in 1907 when Amelia Schlorer decided to start selling her own mayonnaise recipe originally used in salads sold in the family grocery store. Mrs. Schlorer's mayonnaise was an instant success with local customers and eventually grew into the Schlorer Delicatessen Company. Around the same time in New York City, a family from Vetschau, Germany, at Richard Hellmann's delicatessen on Columbus Avenue, featured his wife's homemade recipe in salads sold in their delicatessen. The condiment quickly became so popular that Hellmann began selling it in "wooden boats" that were used for weighing butter. In 1912, Mrs. Hellmann's mayonnaise was mass-marketed and later was trademarked in 1926 as Hellmann's Blue Ribbon Mayonnaise. Japanese mayonnaise is typically made with apple cider vinegar or rice vinegar and a small amount of MSG, which gives it a different flavor from mayonnaise made from distilled vinegar. It is most often sold in soft plastic squeeze bottles. Its texture is thicker than most Western commercial mayonnaise. Apart from salads, it is popular with dishes such as okonomiyaki, takoyaki and yakisoba and may also accompany katsu and karaage. Kewpie (Q.P.) 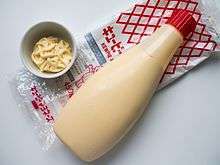 is the most popular brand of Japanese mayonnaise, advertised with a Kewpie doll logo. The vinegar is a proprietary blend containing apple and malt vinegars. Mayonnaise is very popular in Russia, where it is made with sunflower seed oil. A 2004 study showed that Russia is the only market in Europe where mayonnaise is sold more than ketchup by volume. It is used as a sauce in the most popular salads in Russia, such as Russian salad, or Olivier salad (оливье, read [o-liv-yeh], from French Olivier), dressed herring, and also many others. Leading brands are Calve (marketed by Unilever) and Sloboda (marketed by Efko). Mayonnaise is the base for many other chilled sauces and salad dressings. For example, sauce rémoulade, in classic French cuisine, is mayonnaise to which has been added mustard, gherkins, capers, parsley, chervil, tarragon, and possibly anchovy essence. A typical formulation for commercially made mayonnaise (not low fat) can contain as much as 80% vegetable oil, usually soybean but sometimes olive oil. Water makes up about 7% to 8% and egg yolks about 6%. Some formulas use whole eggs instead of just yolks. The remaining ingredients include vinegar (4%), salt (1%), and sugar (1%). Low-fat formulas will typically decrease oil content to just 50% and increase water content to about 35%. Egg content is reduced to 4% and vinegar to 3%. Sugar is increased to 1.5% and salt lowered to 0.7%. Gums or thickeners (4%) are added to increase viscosity, improve texture, and ensure a stable emulsion. Mayonnaise is prepared using several methods, but on average it contains around 700 kilocalories (2,900 kJ) per 100 grams, or 94 kilocalories (Cal) per tablespoon. This makes mayonnaise a calorically dense food. Egg-free versions of mayonnaise are available for vegans and others who want to avoid eggs, animal fat, and cholesterol, or who have egg allergies. In the U.S., these alternatives cannot be labelled as "mayonnaise" because of the FDA's definition of mayonnaise making egg a requirement. In August 2015, the United States Food and Drug Administration sent out a warning letter to the San Francisco company Hampton Creek, objecting to the name of their "Just Mayo" product, which is not egg-based, so does not meet the U.S. legal definition of "mayonnaise". ↑ "Mayo - Definition and More from the Free Merriam-Webster Dictionary". Merriam-webster.com. Retrieved 14 February 2015. ↑ "Science of Eggs: Egg Science". Exploratorium.edu. Retrieved 17 November 2011. ↑ Moran, Victoria; Moran, Adair (2012). Main Street Vegan: Everything You Need to Know to Eat Healthfully and Live Compassionately in the Real World. Penguin. p. 168. ISBN 9781101580622. Retrieved 28 November 2015. ↑ "Emulsifiers — Experiments". Practical Chemistry. Retrieved 17 November 2011. ↑ "Making an Emulsion". Science Project Ideas. 1 October 2010. Retrieved 17 November 2011. ↑ "Le cuisinier impérial, n.". Le cuisinier impérial. Barba (1806). Retrieved 24 November 2014. ↑ "The French Cook, Or, The Art of Cookery: Developed in All Its Branches - Louis Eustache Ude - Google Books". Books.google.com. Retrieved May 30, 2015. ↑ "Le cuisinier royal, n.". Le cuisinier royal. Barba (1820). Retrieved 24 November 2014. ↑ de La Reynière, Grimod (1808). Manuel des amphitryons. Capelle et Renand. Retrieved 26 November 2014. 1 2 Trutter, ,; Beer, Günter (2008). Culinaria Spain (Special ed.). Germany: H.F. Ullmann. p. 68. ISBN 9783833147296. ↑ Dictionnaire de l'Académie française, neuvième édition, "3. Anciennt. Le jaune de l'œuf." ↑ Acton, Johnny; Adams, Tania; Packer, Matt (2006). The Origin of Everyday Things. New York: Sterling. p. 151. ISBN 978-1-4027-4302-3. ↑ "mayonnaise, n.". Oxford English Dictionary. OUP. Retrieved 21 April 2011. ↑ Randall, Theo. "perfect mayonnaise recipe: Recipes: Good Food Channel". Retrieved 26 December 2012. ↑ Segil, Wallace; Zou, Hong (2012). Eggs: Nutrition, Consumption, and Health. New York: Nova Science Publishers. ISBN 9781621001256. ↑ Depree, J. A; Savage, G. P (2001-05-01). "Physical and flavor stability of mayonnaise". 12 (5). doi:10.1016/S0924-2244(01)00079-6. ISSN 0924-2244. ↑ "Good Eats Season 4 Episode 10 - EA1D10:The Mayo Clinic". Good Eats Fan Page. Retrieved 8 January 2012. ↑ This, Hervé; Gladding, Jody (2010). Kitchen Mysteries: Revealing the Science of Cooking (Pbk. ed.). New York: Columbia University Press. p. 39. ISBN 0-231-14171-8. Retrieved 31 May 2012. ↑ "Food Industry Application Reports - Sauces & Dressings". Silverson Mixers. Retrieved 3 October 2013. ↑ "IKA - 1000 liters Mayonnaise in only 10 minutes!". Ikaprocess.com. Retrieved 14 February 2015. 1 2 "Chile - Consumo de mayonesa | Latin American Markets". Web.archive.org. 2005-11-26. Archived from the original on 26 November 2005. Retrieved 2016-02-12. ↑ "wetten.nl - Wet- en regelgeving - Warenwetbesluit Gereserveerde aanduidingen - BWBR0009499". wetten.nl. 24 March 1998. Retrieved 30 January 2014. ↑ "Mayonnaise sales in Europe". Foodanddrinkeurope.com. 29 April 2004. Retrieved 23 June 2009. ↑ "The Milwaukee Journal - Google News Archive Search". Google News. Retrieved 27 August 2015. ↑ Smith, Andrew F. (2007). The Oxford Companion to American Food and Drink. New York: Oxford University Press. p. 397. ISBN 9780195307962. Retrieved 14 February 2015. ↑ Hachisu, Nancy Singleton (2012). Japanese Farm Food. Kansas City, Mo. : Andrews McMeel Pub. ISBN 1449418295. ↑ "Kewpie mayo wins the condiment game". Food Republic. Retrieved 30 June 2014. 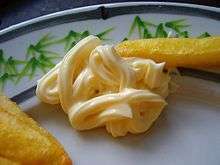 ↑ "What Is Japanese Mayonnaise and How Is It Different from American Mayo? | POGOGI Japanese Food". Pogogi.com. 31 July 2012. Retrieved 14 February 2015. ↑ Okonomiyaki World (2015-11-04). "Ingredients - Okonomiyaki World - Recipes, Information, History & Ingredients for this unique Japanese Food". Okonomiyaki World. Retrieved 2015-11-28. ↑ Itoh, Makiko (2013-03-22). "Why not just add a dollop of mayonnaise?". The Japan Times. Retrieved 2016-07-01. ↑ "おいしさロングラン製法｜キユーピー". Kewpie.co.jp. Retrieved 17 November 2011. ↑ "Moscow's particular taste in sauces". FoodNavigator.com. Retrieved 27 March 2013. ↑ Robuchon, Joël (2009). Larousse Gastronomique (Updated ed.). London: Hamlyn. p. 1054. ISBN 9780600620426. ↑ "Mayonnaise Manufacture Case Study" (PDF). Silverson. Retrieved 3 October 2013. ↑ "10 Healthy Substitutes For Mayonnaise". Huffingtonpost.com. 26 February 2014. Retrieved 27 August 2015. ↑ "CFR - Code of Federal Regulations Title 21". Accessdata.fda.gov. Retrieved 2016-02-12. 1 2 3 "Hampton Creek Foods 8/12/15". Fda.gov. 20 August 2015. Retrieved 9 September 2015. ↑ "Main Street Vegan: Everything You Need to Know to Eat Healthfully and Live ... - Victoria Moran, Adair Moran - Google Books". Books.google.com. 26 April 2012. Retrieved 27 August 2015. ↑ Goldstein, Katherine (27 December 2013). "Vegenaise vs. Mayonnaise: Why Vegan-substitute mayo is better than regular mayonanaise". Slate.com. Retrieved 27 August 2015. ↑ "Plamil: Egg Free Mayonnaise". Plamilfoods.co.uk. Retrieved 27 August 2015. ↑ Erica Swallow (2014-08-28). "Hampton Creek's Plan to Reimagine the Future of Food". Web.archive.org. Archived from the original on 7 September 2015. Retrieved 2016-03-22. ↑ Ariel Schwartz (11 September 2013). "The Most Realistic Fake Eggs In Existence Are Now On Sale | Co.Exist | ideas + impact". Fastcoexist.com. Retrieved 9 September 2015. ↑ "Mayonnaise". Gpo.gov. Retrieved 2016-03-17.